Thank you for all the Pumpkin quilt love! I’ve had so much fun seeing cute pumpkin blocks and quilt tops popping up on Instagram! 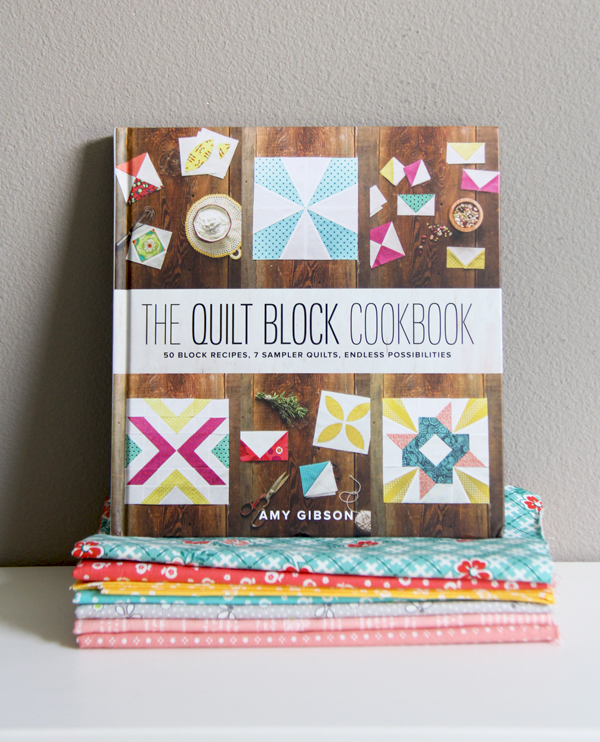 I took the week off from sewing…but I did sneak into my sewing room once to start a project from this book, The Quilt Block Cookbook, by Amy Gibson. This book is pretty ingenious. Everything is laid out like a cookbook, and the units of each block are the “ingredients”. It’s very cute and the photography is gorgeous. I made block 32 Flag Day. I’m going to keep at it and make a whole quilt out of this block! There are “recipes” for 50 blocks and sampler quilt patterns in the back. 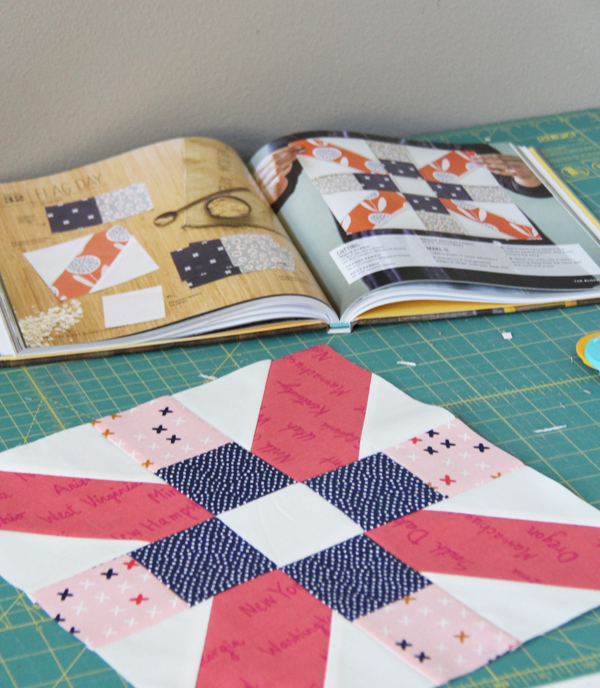 I love the creative layouts for the sampler quilts. 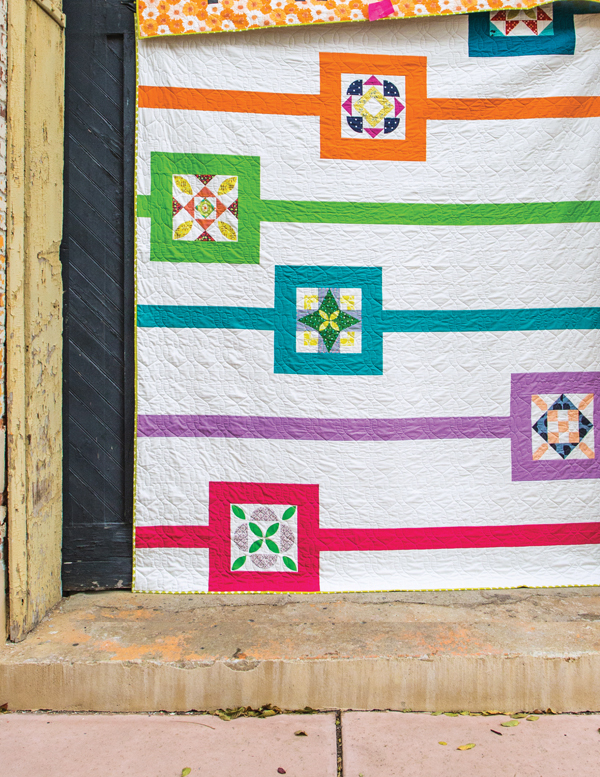 I love sampler quilts but I don’t always love the block layouts…there are beautiful modern ones in this book. You can find this book and get a better peek inside of it here. 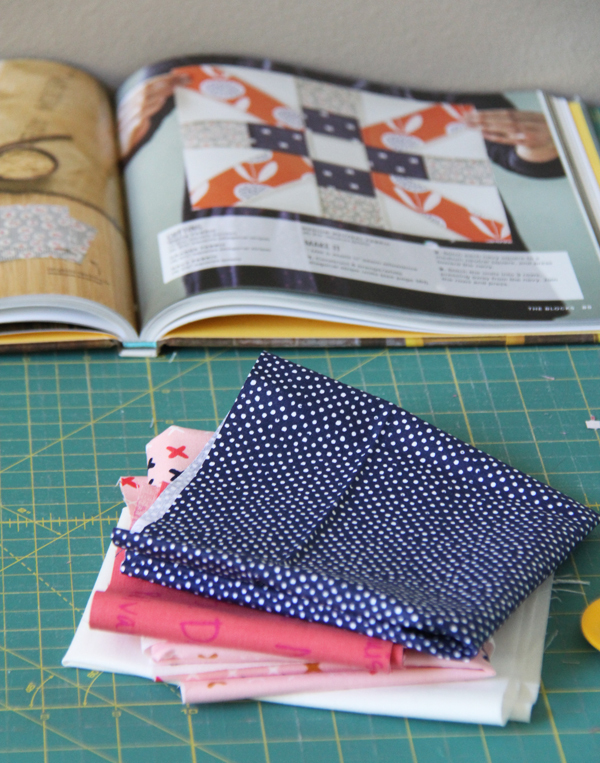 I’m taking a little sewing haitus to work on some house and family projects…but I have a fun quilt and tutorial to share next week. 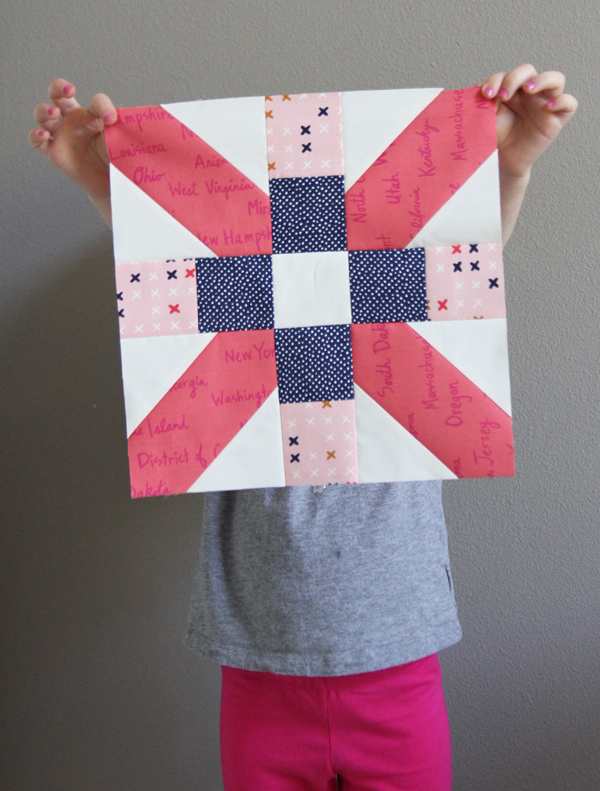 I made the quilt top and even wrote the tutorial… and my Mom brain completely forgot about it! So I’ll post it next week. Thank you for the review of this book! Looking forward to your post of the quilt top next week! Enjoy your family time!!! Love that first sample quilt top you posted. May need to add this book to my christmas list. Looks like a great book! And I notice Sophie’s pink fingernails right off the bat! Just received the book in the mail the other day and fell in love with it. Your block choice is great and your fabrics are incredible… Should be wonderful. What a great review! Thanks for all the photos. I can hardly wait to buy this book! Glad to hear the good book review! My copy is supposed to arrive in the mail today – yahoo! I completely agree about sampler layouts and am looking forward to making one that has a modern feel. Love, love love this book! Sends designs spinning thru my head. HI, THANKS for a neat book review! Looks Neat! Love your version of the block: And it looks like a good book! And I even hate cooking! LOL!! Looks like a great book and creative to do a “cook book.” Pink nails – pretty nice! Enjoy your week and looking forward to your next post! 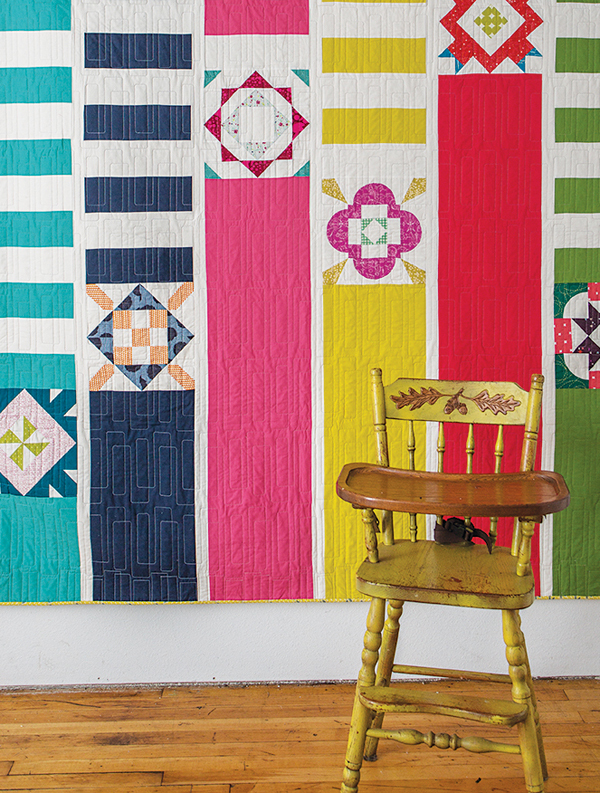 You do a really good job, in my view, of bridging the traditional/modern quilting divide. Congrats! These two quilts are lovely. I do love that you showed their examples of the blocks put in a more modern context. I agree, for me, it makes them much more appealing! p.s. love the colors you chose for the block you made! And it turned out great. Tell Sophie that her fingernails are sooo pretty! Your review of the book and lovely same square makes me excited to dive right into trying my hand at block making. Thanks to you and your little pink naoled assistant. I received the Quilt Block Cookbook for my birthday, love love love it. Also got Scraps, Inc. Vol. 1, it is really great also.